Christa E. Goldbach, age 74, of Grand Marsh, Wisconsin died Monday, October 17, 2016 at her home in Grand Marsh, Wisconsin. Funeral services will be 3:00 p.m. on Sunday, October 23, 2016 at the Roseberry’s Funeral Home in Friendship, Wisconsin. Pastor Terri Skildum will officiate. Visitation will be 1:00 p.m. until the time of service on Sunday at Roseberry’s Funeral Home. Interment will be at the Wisconsin Memorial Park, Brookfield, Wisconsin at a later date. 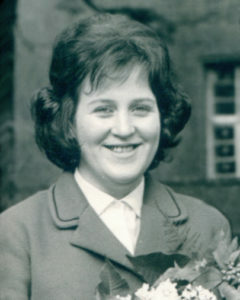 Christa was born April 18, 1942 in Konigsberg, Ost Prussia – Germany to Otto and Elisabeth (Leerch) Barkowski. She married David N. Goldbach on December 20, 1965 in Berlin, Germany. They moved back and forth from Germany to America several times from the 1960’s to the 1980’s while David served in the Army. They moved to their home in Grand Marsh in 2000. Christa enjoyed jewelry making, crocheting, helping others, and crafts. Christa was a member of Faith in Action, Arkdale Trinity Lutheran Church, and many other civic clubs. Christa was preceded in death by her parents, Otto and Elisabeth Barkowski; son, Adrian Goldbach; son, John Michael Goldbach; and brother, Klaus Barkowski. Mein tiefstes Beileid zum Verlust deiner Frau. Leider konnte ich zur Beerdigung aus gesundheitlichen Gründen nicht nach Amerika kommen. Ich trauere auch um meine Schwester. Vieleicht war es eine Erlösung,nach Ihrer Krankheit, für Sie. So very sorry to hear of Christa’s passing! Keeping you in my thoughts and prayers. Christa was one of those warm,wonderful people that always brought an immediate smile to my face every time we met. Her sense of humor was grand! We shared many laughs & crochet patterns. My heart will remember her always! Our hearts goes out to all. We met Christa and Dave last year and we all had a great time when they arrived at Camp Goldbach, Christa was so much fun while we were all there and kept us all laughing the whole time.. We know Christa will be missed by all the people she came in contact with. Especially US. What a great honor it was to meet such a loving and kind woman! She will be truly missed by all that loved her. My prayers are with the entire family during this tough time of grief. Dave and family, our deepest sympathies on your loss, we feel better knowing we got to say goodbye to our friend who had such a passion for life, love and giving to others. RIP Christa. Bob and my heart goes out to all. Christa always made every visit much more fun . Although she will be dearly missed, I feel blessed and Grateful to have had her friendship and Proud to have called her ‘Mom’. Raymond and Michele, so sorry to hear of the Loss of Your Mother. You and Your Family are in our Thoughts and Prayers! God be with You All during this most difficult time! Ray and Michele and Family my prayers are with you all . Dave & family, So sorry to hear of your loss. She was a wonderful & caring person, who will be missed by many. I know John & Christa will spend time catching up in heaven. Prayers & hugs.